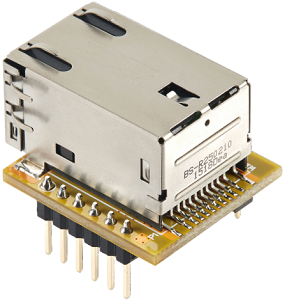 WIZ850io is an compact-sized network module that includes W5500(TCP/IP & Ethernet MAC & PHY) & MAG-JACK (RJ45 with X’FMR) with other glue logics. As it is hardware compatible with WIZ820io, you can easily replace the WIZ820io with WIZ850io just by updating the firmwware. For more information, please refer to the following link; http://wizwiki.net/wiki/doku.php?id=products:wiz850io:start. When you get a WIZwiki-W7500 platform board first on your hand, the serial driver installation and hardware test are needed. Because WIZwiki-W7500 uses CMSIS-DAP firmware writing and does serial communicate through UART1 on W7500 (Target MCU). How to install WIZwiki-W7500 serial driver. WIZwiki-W7500 has a built-in default firmware. You can do self-test with the default firmware as below. Test Sequence 1. Connect Ethernet cable, USB cable to WIZwiki-W7500. If you have a SD card, insert the SD card. 2. Run the Device Manager in Control panel and check which COM port is allocated to the USB port on WIZwiki-W7500. 3. Press Reset SW, then LED ‘D4’ on WIZwiki-W7500 will be turned on. If D4 is turned off, then press the Reset SW again. 5. Run a command window and proceed with the ping test to WIZwiki-W7500. 6. WIZwiki-W7500 operates as loopback server. 7. Make proceed with the ping test or loopback test with an IP of 192.168.077.009 on WIZwiki-W7500. 8. If you can do everything well, then your WIZwiki-W7500 doesn’t have any problem. WIZnet WIZwiki Platform based on WIZnet’s MCU. WIZnet WIZwiki-W7500 is a WIZwiki platform board based on W7500. The IOP4IoT W7500 chip is one-chip solution which integrates an ARM Cortex-M0, 128KB Flash and hardwired TCP/IP core for various embedded application platform especially internet of things. If you use WIZwiki-W7500, you will be able to easily develop a prototype. It is compatible with Arduino Shields. This is using the CMSIS-DAP USB and ISP Header easily available firmware writing.